The best heroes and villains need to be SEEN and not just talked about and with the Ultimate NPC Deck: NeoExodus this improves the first impressions in any game does that you do by a hundredfold. The Ultimate NPC Deck contains over 40 beautifully illustrated, full-color PDF card images that you can be used to connect and amuse your players with new and interesting heroes and villains. The Ultimate NPC Deck series has more card images than any other card deck on the market today. 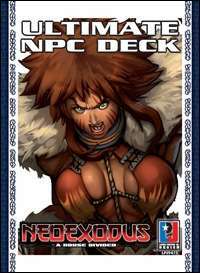 Ultimate NPC Deck: NeoExodus adds a new dimension of new visual flair to any fantasy RPG campaign you might be running. With the blank writable back to these PDF cards you can customize it with whatever information that you might need to records. If you play the Pathfinder Role Playing Game, then you have to have this product. Created by LPJ Design.